LANDSCAPE "LOOKING FOR THE LIGHT". Packed with 230 colour photographs from Cape Reinga to Stewart Island (including 42 spectacular double page panoramas), this 224 page hardback measures 260mm high x 380mm wide & tips the scales at 2.7kg! I personally curated all of the content and layout with numerous pages featuring some of my most iconic gallery prints, to represent the best of my life's work. But almost half of the images are new, released here for the first time. The collector’s edition differs from the standard hardback (featuring my mountain sunrise "Dappled Dawn" cover), which is available from bookstores nationwide & New Holland Publishers. This personally signed edition adds a striking black presentation box to keep it beautifully protected and showcases my hero shot “Jackpot” - a brilliant scarlet tree under a fleeting rainbow, set against a dark brooding sky. Captured with just seconds to spare, driving rain was determined to ruin everything and by the time had I dried my lens to pinch another frame, the rainbow and light had already faded! Various photographs reveal background information of how I captured the image and a short narrative about the location. The "Behind The Scenes" chapter divulges technical data and extended stories, including ‘before and after’ photos, illustrating how the light is so critical. It explains some of the challenges I have faced and boundaries I have pushed, especially in assembling some of my complex composite images for large commercial projects. 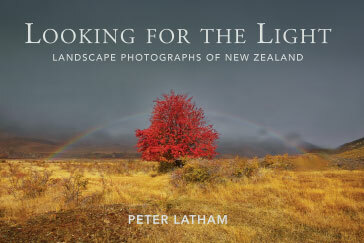 This unique portfolio is accompanied by introductory essays and stories which exceed 17,000 words, creating an original portrayal which stands out from other New Zealand landscape pictorials. Please note: the "Jackpot" collector’s edition is now sold out, although a small number of the "Dappled Dawn" books are still available from a few bookstores nationwide. My new compact hardback (260mm x 180mm x 25mm x 224 pages) is now available, with the same content as the original & features "Highland Spirit" (church of the Good Shepherd at Lake Tekapo) on the cover. Listen to my interviews on Radio New Zealand's Standing Room Only with Lynn Freeman & Radio Southland's Book Show with Terry Toner. SHE THOUGHT IT WAS THE LOVELIEST BOOK SHE’S EVER SEEN! THE BOOK ARRIVED TODAY THANKS SO MUCH! IT’S GREAT TO HAVE THE EXPLANATIONS UNDER WHICH THE SHOTS WERE MADE. DO YOU PLAN TO PUBLISH MORE BOOKS IN THE FUTURE? CONGRATULATIONS ON A STUNNING COLLECTION OF AMAZING IMAGES. 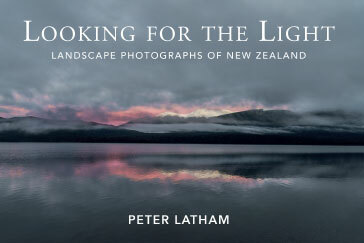 I NEVER BUY LANDSCAPE BOOKS, SO TAKE IT AS A COMPLIMENT I HAVE PURCHASED YOURS! I HAVE ALWAYS LOVED THE SCENERY IN NZ & YOU HAVE CAPTURED IT PERFECTLY. IT TOOK MY BREATH AWAY & I KNEW I NEEDED TO HAVE IT! WE ARE NEVER FAR FROM THE COASTLINE IN AOTEAROA (NEW ZEALAND). IT STRETCHES 14,000 KILOMETRES – THE TENTH LARGEST IN THE WORLD. PER SQUARE KILOMETRE THAN ANY OTHER COUNTRY.